Bagan Archaeological Area and Monuments is part of the Tentative list of Myanmar in order to qualify for inclusion in the World Heritage List. It's nearly impossible to visit Bagan and not find at least one temple or vista awe-inspiring. I traveled with a Burmese family doing an annual pilgrimage to Bagan, and it was interesting to see how their trip differed from some of the more classic ways that tourists tour it: via bicycle and in just a day. We started before dawn, when it was still dark and headed to Mount Popa, where we trucked it up the mountain and began what would be two days of temple hopping. After each visit, we would pile back into the bed of the pickup truck and head with our incense, flowers, and gold leaf to the next spot. And of course, we watched sunset at a temple—that's a must do. The stupas change color throughout the day, and some vary by composition. So you have rose-pink temples in the early morning light, dull brick by the harsh light of mid-day, and a brilliant ochre when lit by the setting sun. Make sure that you are out early on the day(s) you visit so you can see the full range. One of the things I loved about going via the truck is some of the more rural areas that we passed. 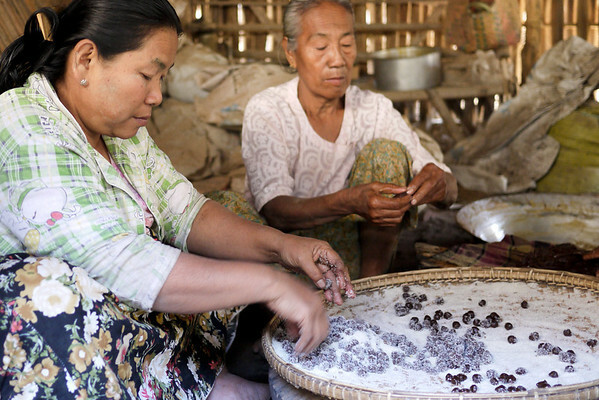 Locals from the region sell jaggery candies and sour plum treats a bit outside the tourist center, and they're tasty! Make sure that you keep an eye out for these small round purple balls — they are hand-rolled sour plum paste dipped in sugar! Lastly, probably consider a guide of the more important temples, or even a half-day tour. It's impossible to truly appreciate the deep history and the significance of the different temples without backstory and explanation of what these places mean to the locals. Bagan is still a living place of worship for the Burmese, and it's a fascinating window into the way Burmese people practice Buddhism. Highly recommended. It can only the politics of Burma that has kept it on the tentative list, because it's a must visit and a real highlight of Southeast Asia on the whole. Bagan was a powerful kingdom from the 11th to the late 13th century: the empire stretched over almost all of what now is Myanmar. The remains of its ancient capital city comprise over 2,000 temples, monasteries and pagodas. They were constructed in a religious construction frenzy by Bagan’s rulers and wealthy subjects. 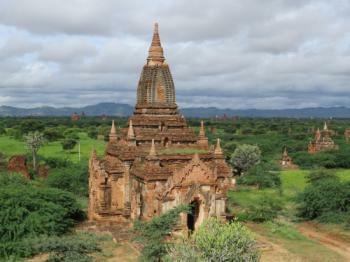 Bagan at this time also became a center for religious study, attracting devotees from afar. Although it lost its prominence in the 14th century, the site was never abandoned and has stayed a pilgrimage destination throughout. Nowadays Bagan is Myanmar’s tourist central, and it delivers proof that even the gentle Burmese can turn into annoying souvenir sellers & touts given a steady influx of wealthy tourists. I stayed in Bagan for 4 nights, using it also as a base for a side-trip to the wooden monasteries of Pakhangyi and Pakhannge. It was the end of the rainy season, and I experienced mostly partly cloudy weather during the day and a daily heavy downpour around 3.30 p.m.. I ‘did’ two longer trips of exploration among the monuments, once by mountainbike and the other time cruising around on an e-scooter (a rightly popular mode of transportation at the site). There’s no clear ‘Angkor Wat’ among Bagan’s religious monuments, no flagship temple or monastery that serves as the site’s iconic image. I would say that the two best contenders are the Ananda and Sulamani Temples. The Ananda was built in a fusion of Mon and Indian styles, and today is the most lively among the temples with worshipping Burmese. There’s an interesting tier of green terracotta glazed tiles around its outer wall. The Sulamani (aptly meaning 'Crowning Jewel') looks more refined, also more ‘complete’ than many of the other temples. It is tempting to make comparisons to Angkor as the two sites are so similar in many aspects, but either because of the worse state of conservation or the hasty (re)construction work I found Bagan less impressive in its artistic features. 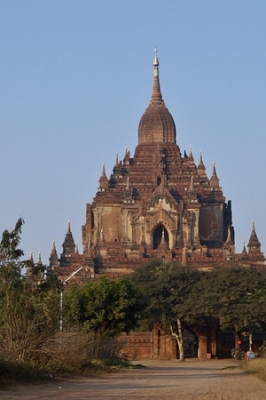 It is worth visiting Bagan's Archaeological Museum early during your stay. The museum is housed in a grand building with lots of empty space, but many of the exhibits are of good quality. Signs in English tell that they do apologize for the electricity problems, and are working on a better museum! Here you can see a model of how Bagan looked like during its heyday: now only the temples and pagodas remain, but in between there was a city of 50,000 – 200,000 inhabitants living in wooden houses. They also display the 55 hair styles for women (and 5 for men) that can be seen at the various wall paintings in Bagan, all variations on long black hair in a ponytail. A lot of the joy of Bagan comes from exploring its smaller or more outlying temples and pagodas. The good ones include the Ananda Ok Kyaung (a chapel with detailed murals, including depictions of Portuguese traders), the Upali Thein (well-preserved murals, can only be seen peeking through the closed door), the Tayok-pyi pagoda (has a façade with fine carvings) and the big red Dhamma-ya-za-ka Zedi in the morning light. 2017 is now the estimated admission year of this major historical site to the WH list. It fell victim before to possibly the worst case of polarization in the history of World Heritage, a whole thesis can be written about the stand-off between the Myanmar military rulers and UNESCO & other representatives of the international community. It ended up with a Referral in 1997, stating the need for buffer zones and management plans but not mentioning the shoddy reconstruction techniques, the construction of the Nann Myint Viewing Tower in 2005 or the displacement of the population of Old Bagan that were among the critical issues earlier on. I visited Bagan just recently in April 2014. While I can observe that adding gold leaf is one of the rituals given to Buddha, and constant renovation by the government of Myanmar instead of preservation, I still wish that Bagan will go into World Heritage List. Perhaps, this is the reason why the temples, pagoda, stupas survived time because the Myanmarese take care of them by doing renovation. One can still get awed by the frescoes and stuccos as well as Buddha images found in the temples. While, tourists can climb up the stupas right now to get an aerial view and a good view of the sunset or sunrise, I believe this should be regulated as it will eventually ruin the structure. If this archaelogical zone be included in the WHS list, I believe UNESCO will help a lot in its preservation. The Bagan Archaeological zone stretches across 42 sq kms of the Irrawaddy plain and contains literally thousands of temples, pagodas, monasteries and other structures from the 11th to 13th centuries built in the golden age of the first great united kingdom of Burma. King Anawrahta (1044-1077), having overcome the rival Mon kingdom of Bago, embarked upon a massive construction program in support of Buddhism (primarily of the Theravada variety but also accepting influences from Mahayana, Hinduism and local animist “Nat” religions) which continued under his successors until 1297 when, as a result of Mongol invasions and other contributory factors, the kingdom disintegrated. A few of the largest remaining structures continued as pilgrimage destinations to this day whilst the others (the vast majority) gradually fell into disrepair. The joy of visiting such a site is to be found both in taking in the grand buildings but also in exploring the numerous smaller structures scattered among the agricultural landscape. It is a site one could easily give 3 or 4 days and still be benefiting from new experiences, but in Nov 2012 we had only 1 full day plus half an afternoon! However, this was not my first visit as I had spent a full day there way back in 1977 and the comparison across those years identified a series of interesting issues. My first visit had been by horse and cart and it was nice to see that these were still operating but, on this second visit, we made full use of a car across 9 hours in order to fit in as many of the major sites as possible. Bike hire is also widely available but would need at least a couple of days. To WHS enthusiasts the site is also of interest as Myanmar’s only attempt to date at gaining an Inscription – it was deferred in 1997 with its Universal Value fully accepted but its management found greatly wanting. The story of this aspect of the site touches upon a number of significant issues both regarding Myanmar’s recent undemocratic history and also on the problems of preserving such a site in a developing country which needs tourism, lacks skills and, in any case, doesn’t fully accept UNESCO’s view of the World! Because of this I tried at every opportunity to find out details from the locals about UNESCO’s troubled relationship with Bagan and Myanmar over the last 20 years! My memories of the site in 1977 include 2 aspects which have totally changed over those 35 years. First the increase in numbers of tourists. 2012 arrivals are expected to be almost 60% up on 2011 which itself was a record year of 120000. The trend is ever upwards at a similar rate, limited only by hotel rooms at Bagan and the ability of Myanmar as a whole to receive yet more – most people visiting the country will go there. There are currently 2000 hotel rooms in Bagan and activity is taking place to double this in the near future. In 1977 there was one upmarket hotel of perhaps 40 rooms and a few “hippy” guest houses – so I saw almost no other tourists during the day! And all tourists were limited to a 1 week visa and counted themselves lucky if they managed to make it up to Bagan for a single full day! The second major change is that the site is no longer an archaeological “ruin”. In 1975 a major earthquake had inflicted significant damage both to the minor temples and pagodas but also the major structures. And that was merely the latest of a series of such events over the centuries which, combined with the ravages of time, had given the entire site a ruined aspect. Now there is hardly a ruined structure remaining. Unfortunately however this is isn’t due to the hard work of dedicated trained archaeologists working to the highest international standards of renovation. Instead it is a reflection on the cultural obsession of Myanmar’s people with building “merit” towards the achievement of Nirvana by sponsoring the renovation of any Buddhist monument which has fallen into disuse. Such renovation pays scant attention to authenticity in the use of materials and in design – so Stupas acquire shapes, colours and accretions which have no foundation in Bagan’s architectural history. There is hardly a structure which doesn’t have standing next to it a stone on which is engraved the details of the individuals or organizations which have organized/funded the changes! From its religious and cultural viewpoint Myanmar regards it as far more important to restore a Buddhist monument back to religious use with a Buddha statue than to worry about the niceties of brick manufacture and stucco work – and who is to say it is wrong! The other great change over the last 35 years relate to the overall environment of the site. The forced movement of people from Old Bagan to the town of “New Bagan” in 1990 before adequate services etc were provided and without adequate compensation has been cited (perhaps not totally fairly) as an infamous example of the old regime’s callousness in dealing with its people. The construction of hotels by regime “cronies” has been another. In 2012 we stayed at the most infamous hotel of them all the luxurious “Aurium Palace” owned by Tay Za, the target of US and EU sanctions for his activities as part of the regime. (see photo across its infinity pool - we didn’t take a $300 balloon ride!!) The Bagan golf course resort had been a major cause of Bagan’s UNESCO deferral in 1997 and the Aureum Palace has also incurred UNESCO’s displeasure. A particular unfortunate feature is its Nan Myint Viewing Tower. Opened in 2005, it is 60 m high in brown concrete and glass in circular form with an external staircase (as well of course as internal lifts) to mimic the traditional Burmese watch tower (which isn’t relevant to Bagan!). As well as providing fine views over the Bagan plain, it can equally be seen from nearly everywhere across the site! ii. Gubyaukgyi at Wetkyi-in. Fine frescos with huge gaps where some were removed and taken to Germany in the late 19C by a Dr Fritz von Nottling (I can find nothing about what happened to them). v. Ananda. Perhaps the finest of the large temples – externally and internally. We visited on 2 days. We also stopped off at smaller pagodas/stupas and for photos etc of course – all in all, a pretty full day. One major change in my appreciation of the site compared with my first visit in 1977 (No Lonely Planet guide in those days!) was the internal decoration of many temples. Without torch or explanation this aspect had passed me by as I concentrated on the exteriors. It was good to have this missed aspect rectified. I would suggest that having a good guide was worthwhile – otherwise (even with LP or similar) what you are seeing is a bit like watching a movie in a foreign language! So many areas of Myanmar (Burma) should be World Heritage Sites, but Bagan is definitely unlike any other location in the world. We visited in May, right after the cyclone, and not only were we the only Americans we saw, but the only tourists. So of course, this made this wide plain of hundreds of temples even more awesome. And access to them is too easy...we climbed to the top of some to see sunsets & sunrises. No one guards the area & the treasures in many of these temples are priceless. The Irawaddy River flows nearby & the pottery markets & people were a pleasure. We have been lucky to visit many sites in the world from Angor Wat to Tikal to the Pyramids. And Bagan is as impressive in its own right. We hope the Myanmar generals & government will see the benefit of allowing Unesco to grant WH status to Bagan.